TRUTH: Modern methods of teeth whitening, including laser teeth whitening or Air Flow technique, have minimal harmful effects. Nevertheless, one must remember that teeth whitening may not be recommended for all people, especially for those who have extremely sensitive teeth, problematic enamel, underdeveloped tooth tissues, or facial composite restorations and crowns. MYTH #2: AFTER ANY BLEACHING PROCEDURE TEETH DO NOT REMAIN PEARLY WHITE FOR A VERY LONG TIME. TRUTH: In average, the effect can last for about a year or so, but after every additional bleaching procedure the duration of the effects usually decreases. Generally most patients will "touch up" bleach their teeth periodically to maintain their pearly whites. MYTH #3: IT IS NOT HARMFUL TO WHITEN YOUR TEETH WITH SODIUM BICARBONATE OR BETTER KNOWN AS BAKING SODA. TRUTH: It is, actually, very harmful, because sodium bicarbonate we use for baking has very strong abrasive effects. If you want to whiten your teeth in an easy way, the use of special whitening toothpastes with bicarbonate contain much smaller particles of bicarbonate and they do not damage teeth as much. MYTH #4: HYDROGEN PEROXIDE WILL WHITEN MY TEETH IF I SWISH WITH IT DAILY. TRUTH: While Peroxide MAY slightly lighten your teeth if swished with, it CAN however cause serious chemical burns to the soft delicate tissues inside your mouth. This route is highly discouraged by dental professionals. MYTH #5: IF MY TOOTH ENAMEL IS WHITE, THE TOOTH MUST BE CONSIDERED HEALTHY. Dental disease affects 78% of dogs and 68% of cats over age 3. Periodontal trouble in animals causes the same problems that it does in humans: from mild tartar and gingivitis to receding gums; significant inflammation and tooth loss. When you are ready to start brushing your pet's teeth do not use your toothpaste, this has to much fluoride in it, also this is toxic to animals. You can go to your local pet store and find tooth past that is right for your pet. While holding your pet, put a little bit of the toothpaste on your finger, and let them taste it. Next gently put your finger in their mouth and rub the gum line. Once you and your pet have this down (may take a few weeks) try using a children's soft toothbrush. The most comfortable way to brush your pets teeth is have them on your lap (if they are small enough) and have their head face away from your body. Use your left hand to brush the right side of her mouth and vice versa. For large pets, have them face you while they sit and start brushing! Did you know February is National Children's Dental Health Month? Well now you do! If your a teacher or have a child at home and would like to teach them about dental plaque, here is a fun easy science experiment! Place 2 tsp. of yeast into each cup. Add 1 cup of warm water into each cup. Add 1 TB sugar to ONE cup. This is an great lesson to show children why its so important that we brush and floss our teeth twice a day. *If your a teacher you can pair this lesson with a new toothbrush for each student for extra excitement! Many people leave their doctors office following a surgical extraction with a list of generic "do's and dont's", but a lot of people don't have a clear understanding of which types of foods to stay away from until the gums are healed. Below is a list of suggestions (straight from a dental assistant) to help with the decision making process. In addition to these foods and drinks, smoking is an irritant and should be avoided following an extraction. Both smoking and drinking through a straw can be harmful as the sucking motion can cause the bleeding to begin again. As with any surgical procedure, check with your doctor or dentist if you experience excessive pain, bleeding or anything out of the ordinary. Remember: A good rule of thumb is if it's crunchy, don't eat it! Botox is most commonly known for getting the crows feet and wrinkles out of your face. At least that's what is promoted the most about it. However, in reality, botox is used for a lot of medical conditions. If you have get chronic migraines, botox will help. Stiff muscles, a botox injection will take care of it. Even for the some with a overactive bladder. What about teeth grinding? Yes, it reduces that too. Teeth grinding (medically known as bruxism), is a serious issue that can greatly damage your teeth, cause TMJ, and end being very costly to treat. Most of the time it treated with a mouthguard that is designed to reduce the risk to your teeth. However, even with the mouthguard you are still grinding in your sleep. Instead of grinding tooth to tooth, you are grinding on the mouthguard itself. Which, in essence, still causes the jaw pain and can lead to TMJ. It protects your teeth really good, but has a limited effect to protecting your jaw. Botox on the other hand, has been proven to great reduce the grinding all together. So, if you are a chronic teeth grinder, maybe Botox is something to consider. Did you know that 35 Million Americans are missing teeth in one or both jaws? We all know that replacing missing teeth can be expensive and time consuming but replacing teeth is nothing new. Humans have been replacing teeth for decades. If someone had a cavity the ancient dentist would scraped out the hole using a stone tool and then would fill it with bitumen (a tarry substance). 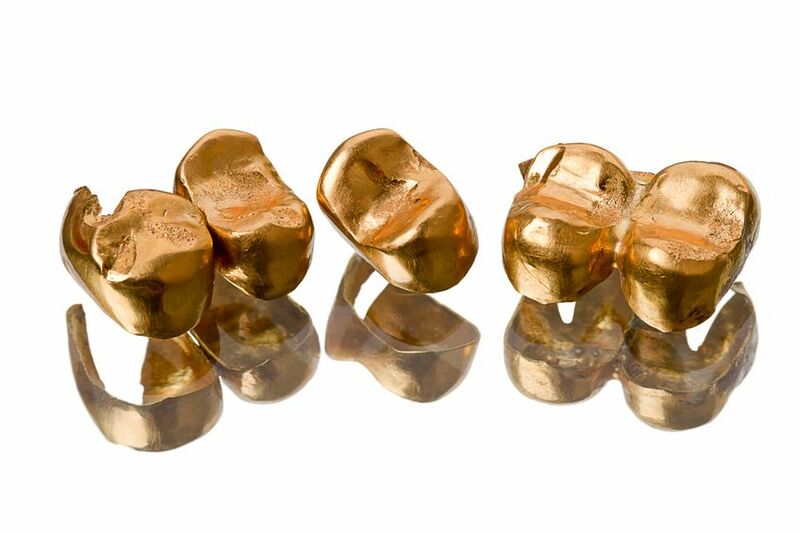 Gold made its debut about 2,500 years ago, and dentistry took full advantage. 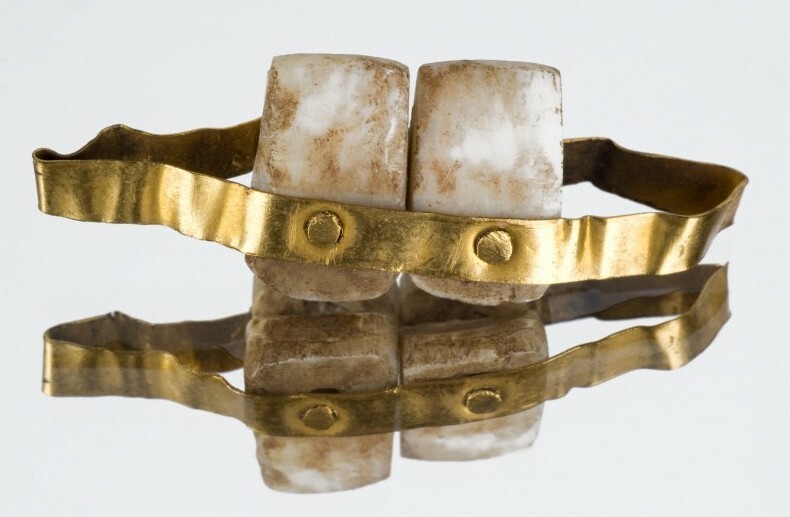 One of the earliest uses of gold wire was to hold teeth together. Gold was able to interact with water, air, food and the environment of a persons mouth without causing rust or wearing. Picture below is an example of a gold bridge. Etruscans crafted some of the oldest known prosthetics and have made one of the earliest attempts at bridges. The picture below is a replica of an Etruscans bridge from around 1901. One of Paul's many talents included dentistry. He would make dental prosthetics using ivory. In 1775, Paul was able to identify the body of a friend thanks to a bridge he crafted himself. This is where the use of dental records and prosthetics came into play when they need to identify bodies. Modern prosthetics are now made from ceramic. 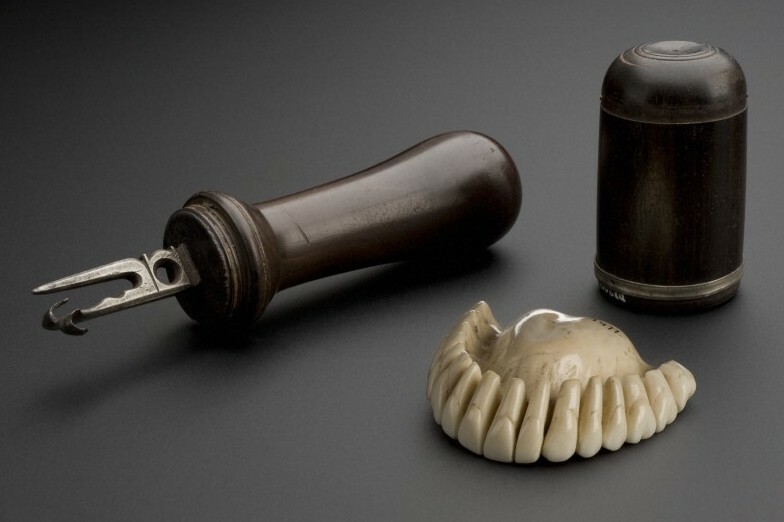 Today, dental prosthetics are held firmly to a patients jaw and are often indistinguishable from natural teeth! Imagines and more information can be found here! Getting a dental impression is not a pleasant or a comfortable procedure for those of us who have a gag reflex but getting those impressions play an important part into your oral health! 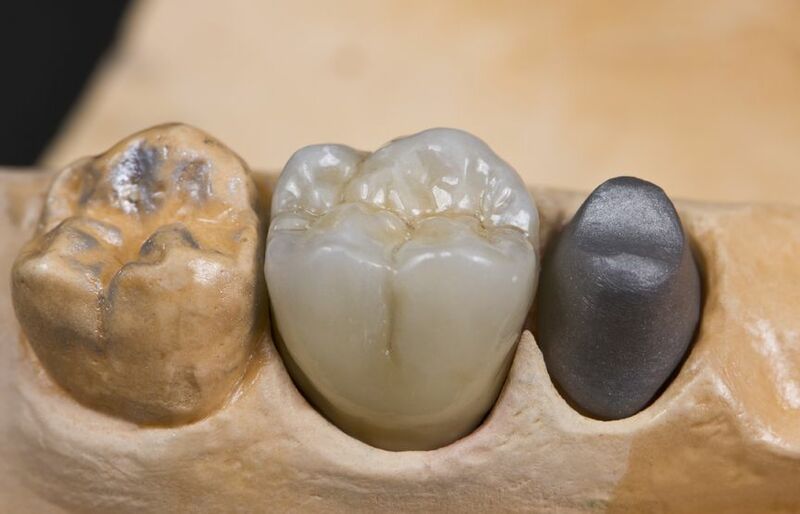 Dental impressions produce a replica of your teeth and oral tissue and are used for many different procedures including: Crowns, mouth guards, whitening trays, retainers, bridges, veneers, dentures and other things. To make a impression of your mouth the dentist or their assistant will mix up a material and put that into a impression try, then they will slowly insert it into your mouth so it covers the entire dental arch. After the material has hardened they will remove the try and the impression will be sent to the lab for further processing. Here are a few pointer if you need a dental impression in the future ask the dentist or the assistant if you can sit up during the procedure, try breathing through your nose and try to focus on anything else besides the gunk in your mouth. Once the impression has been removed ask for a sip of water or mouthwash to rise out your mouth. Dental enamel, unlike bones, does not regenerate or "heal" once it is damaged. Dental enamel is formed during the original growth of the tooth underneath the gums. While there are many factors that can contribute to the loss of dental enamel, such as poor dental hygiene or certain hereditary conditions, there is good news. Researchers are actively seeking treatments and therapies that could change everything. Of course, proper hygiene and regular visits to your dentist are the best way to combat any kind of dental dilemma, but for dental enamel in particular, there are now certain treatments that can help slow the process of enamel degeneration that can be applied during your regular dental visits as part of your preventative maintenance regimen. There is also a plethora of information circulating on the internet that implies there are certain natural remedies that can heal cavities and regenerate tooth enamel, although it isn't scientifically proven as yet. As we come to the end of this wretched flu season, if you are anything like me, you do the normal routine: Wash blankets, pillow cases, sheets and basically disinfect the whole. Especially if you or someone in your household has or had the flu. However, on thing that often gets overlooked is replacing your toothbrush. Even if you didn't have the flu, you want to make sure you replace it. If some in your household had it, or anyone who visited your home had it, then the bacteria and or virus can attach to basically anything. If that gets on your toothbrush, when you brush your teeth you are in essence introducing that virus right into your body. There is a common misconception that a toothbrush is always clean. I can see why that would be assumed. You put toothpaste on it and essentially clean your teeth. However that is not the case. The bristles on the toothbrush are tall and there are many area for bacteria to hide. The toothpaste on it does not clean the brush. There are not many ways to effectively and fully clean your toothbrush so it is better to just replace it. The ADA recommends that you replace your toothbrush every 3 months and after you get sick.